Turf toe is an injury of the first metatarsophalangeal(MTP) articulation, due to hyperextension of the big toe, which leads to damage of the plantar capsuloligamentous complex. It may cause tearing or complete disruption of these structures. 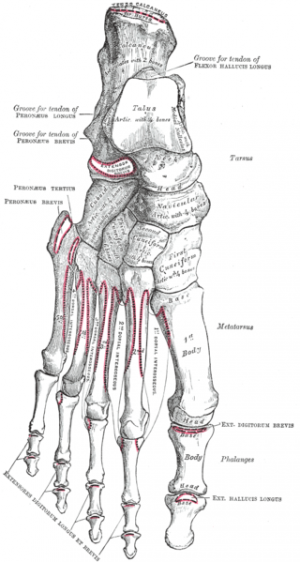 The slightly concave shape of the proximal phalanx with which the first metatarsal articulates creates little joint stability. The plantar capsule is thicker on the proximal phalanx and finishes in a thinner part on the metatarsal head. It supports the under surface of the metatarsal head and resists hyperextension of the metatarsophalangeal joint. Additionally to the plantar capsule and the collateral ligaments, the MTP joint is dynamically stabilized by the flexor hallucis brevis (FHB)(the hallucal sesamoids embedded in the FHB tendons), the adductor hallucis and the abductor hallucis tendons. In 1976 turf toe was for the first time described by Bowers and Martin, they studied the soccer players at the University of West Virginia and ascertained that during one season there where an average of 5,4 turf toe injuries. Further studies showed that the injury was much more frequently by soccer played on artificial turf surfaces. It is caused by an overload on the hallux MTP joint in hyper-dorsiflexion position as happens when one player falls on another players’ heel. The injury results very often not due only to hyperextension but also to a degree of valgus stress. It is characterized by pain as a first symptom, localized swelling, ecchymosis and stiffness of the joint. With an appropriate evaluation we can divide the disease in three grades, each with his proper symptoms and treatments. Grade I injury symptoms are: local swelling, plantar structures attenuation or stretching, minimal ecchymosis. Grade II injury symptoms are: moderate swelling, partial tear of plantar structures and restricted motion as result of pain. Grade III injury symptoms are: indicative swelling and ecchymosis, total disruption of the plantar structures, weakness of the hallux flexion, and high instability of the MTP joint. The physical examination starts with observation and palpation of the sensitivity on the hallux MTP joint, evaluating the stability and the flexion strength. The palpation focuses especially the collateral ligaments, dorsal capsule and the plantar sesamoid complex. If pain is localized on the proximal sesamoids it indicates a strain of the flexor hallucis brevis musculotendinous junction, while turf toe injury is located distal to the sesamoids. Various range of motion manoeuvres of the joint indicate different injuries. Varus and valgus stress do test the collateral ligaments; the dorsoplantar drawer test (Thompson and Hamilton) tells about the competence of the plantar plate; active flexion and extension at the MTP and interphalangeal joints give indications about the extensor and flexor tendons and the plantar plate. Comparing the active flexion strength with the contralateral side, may reveal a disruption of the FHB or plantar plate. Injection therapy may be considered a therapeutic adjunct. The three grades of the injury got a different physical therapy but the initial approach for all three consists in the RICE (rest, ice, compression, elevation) application. Once the acute phase is over, taping in a lightly plantar flexion protects the toe from a too big range of motion and supplies compression. 3 to 5 days after the injury it’s possible to start early rehabilitation consisting in a gentle passive plantarflexion and gradual strengthening. Distraction and dorsal and proximal sliding of the proximal phalanx on the first metatarsal can help restoring a normal ROM and strength. The patient may do athletic activity as bicycling, pool therapy and elliptical training. It’s advisable that the athlete wears stiff-soled shoes limiting the motion of the hallux. A second grade turf toe needs at least 2 weeks to return to activity depending on the athletes’ sport. To increase the range of motion and reduce the pain, passive joint mobilizations are indicated. After the symptoms, as pain and swelling, have been reduced the athlete can start rehabilitation in a soft way with a toe protection, such as a turf toe plate or a Morton’s extension. To control inflammation and assist the healing of the soft tissues, pulsed ultrasound or ionophoresis can be applied. Active exercises can be done; toe extension and flexion exercises like toe crunches, curling up a towel with the toes, moving the toes in a bucket of sand and short foot exercises. When possible, the athlete can progress to higher impact activities (jogging, running, cutting and jumping). The nonsurgical management of a third grade injury requires 8 weeks of recovery and immobilization in plantar flexion. Before restarting sport activity, the hallux MTP joint should return to a 50° to 60° painless passive dorsiflexion motion. Complete rehabilitation can take up to 6 months. 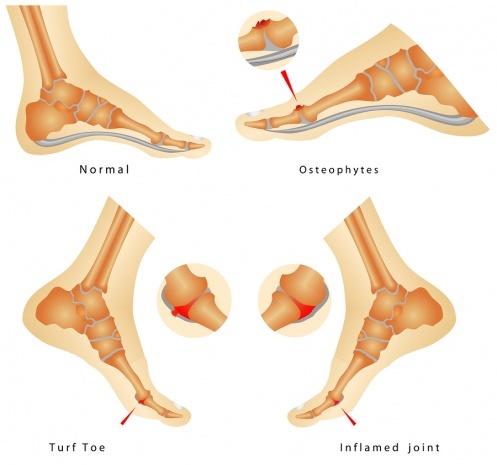 The most important part of the treatment for turf toe is physical therapie rehabilitation and prevention by using of protections, but in certain cases a surgical intervention may be necessary.